Learn to quilt with us! Do you want to learn to make a quilt? 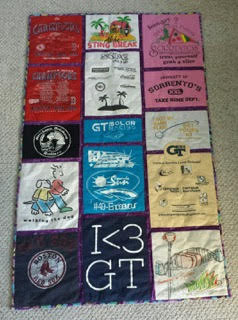 Or preserve special memories with a t-shirt quilt? Or do you want to work on your own project with a bit of coaching, assistance and encouragement? This is the class for you! Classes will meet for two-hour sessions. If you want to stay for a third hour to work on your project, you may do so and Debby will be available during this time. Register now for this 6-session class on Thursdays, April 25th – May 30th! Debby Fink has been an avid quilter and crafter for over twenty years. She has been President of the Mothertown Quilters Guild in Lancaster. She has created over one hundred quilts for friends, family and charity. Her quilts have ranged in style from hand pieced, paper pieced, traditional and modern machine pieced, Hawaiian appliqué, bargello, t-shirt and photo with machine quilting, free motion quilting and hand quilting.